Memphis' premiere bed and breakfast, The James Lee House, will always be my staycation of choice. Its opulence overwhelmed me in the best way possible, as the historic, restored mansion (in the Edge/Medical District) is less than 2 miles from my Downtown town home but felt like 5,000 miles away in France. I nourished in the sweet touches of hospitality by owners José and Jennifer Velasquez. Freshly baked (from scratch) oatmeal cookies were ready in the state-of-the-art kitchen upon my arrival, instantly elevating the mansion's coziness from rain showers outside. Southern white rocking chairs basked the front porch, and upholstered seating throughout the parlor and dining room welcomed travelers from near and far. Before Alex picked me up for a nearby dinner at Ecco on Overton Park and nightcap martini at Mollie Fontaine Lounge (across the street from the bed & breakfast), I caught up on some reading in the grand parlor with a glass of pinot noir and faint orchestral music in the background. The novel I packed along in my Moore & Giles leather weekender had been sitting on my nightstand at home, unopened, for over a month. The luxurious and calm atmosphere of the James Lee House naturally opened the door for an hour of uninterrupted, cherished reading time. To complement the home's complete restoration--from to exquisite interiors and top-of-the-line amenities--I turned to Oak Hall to select a luxe, lounge-able look for the evening. I hinted the upcoming Valentine's holiday with a blush-colored Rebecca Taylor cropped tweed embroidered jacket. The blazer draped over an everyday staple--the Joie Alicia silk racerback tank in Porcelain--and was paired with an daintily trendy Joie Meriner crepe trouser in navy. I brought along slippers for the room, though I slipped on the Loffler Randall Amelia sandal in wheat just in time for dinner. The contemporary classic bathroom boasted elaborate marble and fluffy white towels in every corner. I brought along Trish McEvoy body cream--available exclusively to Memphis at Oak Hall--and a natural-toned makeup planner with brushes and blushes for the evening. The evening was effortlessly enjoyable. And though I've had Ecco's mushroom pasta and Mollie Fontaine's crisp dirty martini already once before, the staycation attitude refreshed those previous dining experiences. 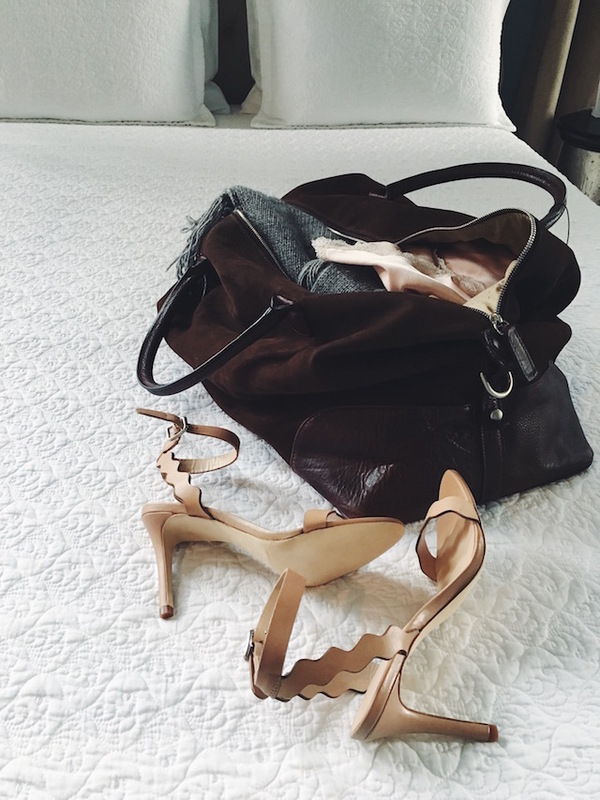 Taking the extra few moments to pack that perfect outfit, plan that romantic meal, and lift those feelings of stress made all the difference. And, of course, I was counting down the moments to breakfast, diligently crafted each morning by José and Jennifer, the dream team. An 8 'o'clock arrival in the breakfast room was welcomed with hot coffee and a display of raisin cream scones--made from scratch (because who are we kidding). The second course was a dainty yogurt parfait, layered with Jennifer's Meyer lemon raspberry marmalade, Greek yogurt, homemade granola, and a sprinkle of fresh berries. Fresh and utterly delightful. The third (and final) course was rich and ridiculously tasty -- I still remember the first bite of buttery prosciutto and hollandaise with a poached egg on a buttered english muffin. The side of potatoes were caramelized in fresh sprigs of rosemary, among other herbs. It was a joy to watch José and Jennifer work together to plate each ingredient, who worked with such focus and emitted a light of appreciation and pride for all they'd accomplished in their years of planning. I shared that pride with them. Whether you choose to staycation solo, or with a friend or lover, the well-deserved break offers an opportunity to unwind, relax, and refresh--all in less than twenty-four hours. And with Valentine's Day soon approaching, I know just the gift for that special someone or for yourself...a stay at the James Lee House! Tell them Caramelized sent you. This post was made possible by The James Lee House's generous hospitality, Oak Hall's fine wardrobe offerings, and Donny Granger's exceptional photography. Thank you for being supportive of my sponsors!